Lotus Blossom Tank KAL: Anyone else presently working on their LBT? Anyone else presently working on their LBT? I'm wondering if I am the only one basically just beginning? I see alot of tanks that are done but can't remember seeing any WIPs. Here is mine from a few days ago. 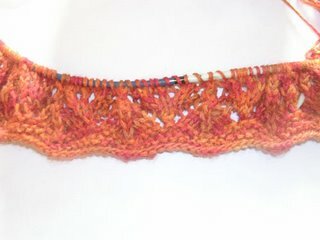 I am now on row 11 of my second repeat of lace. Anyone else still working on theirs? I'd love to see pics! I'm still working on it! I decided to make it a "Tank-with-Sleeves" and then I screwed up "The Sleeve" and so I had to Frog it. We're actually having a little apart time right now... Enjoy! The lace is fun and the color you've picked is lovely! I'm working on an LBT too. I started mine not long ago and I've just finished my second lace repeat. I like the colors you are using for your tank. I think that I am FINALLY going to be able to start mine, so you are not the only one at the beginning. That color is wonderful! Good luck! Great color! Have fun with it! I've just restarted mine. I'm only on row 10 this time, but it's looking pretty spiffy. Yours is coming along well. I'll be working along with you!